For the 24 hours to 23:00 GMT, the AUD rose 0.24% against the USD and closed at 0.7828. LME Copper prices rose 0.3% or $24.0/MT to $7181.0/MT. Aluminium prices rose 0.7% or $14.5/MT to $2256.0/MT. In the Asian session, at GMT0400, the pair is trading at 0.7811, with the AUD trading 0.22% lower against the USD from yesterday’s close. 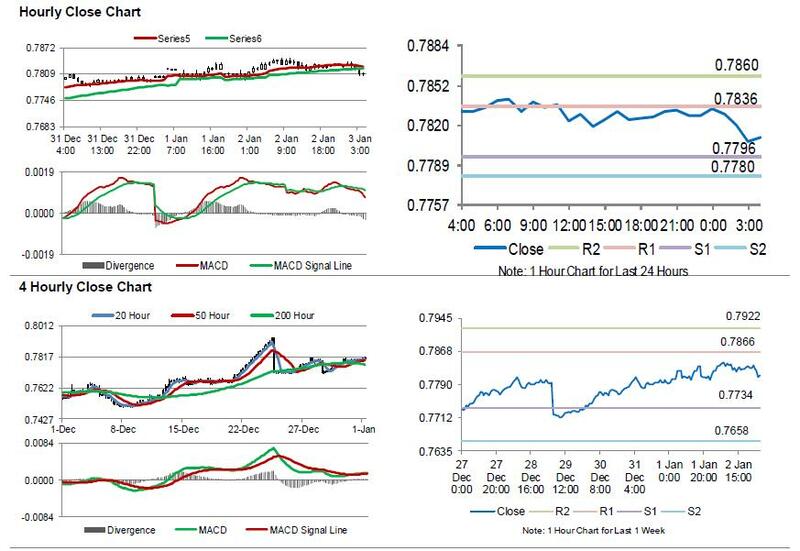 The pair is expected to find support at 0.7796, and a fall through could take it to the next support level of 0.7780. The pair is expected to find its first resistance at 0.7836, and a rise through could take it to the next resistance level of 0.7860. Looking forward, Australia’s AiG performance of services index for December, set to release overnight, would garner significant amount of market attention.